I love the Logitech Wireless Solar Keyboard K750 and the Microsoft Arc Touch Mouse. Having established that, I was looking for something ergonomic. 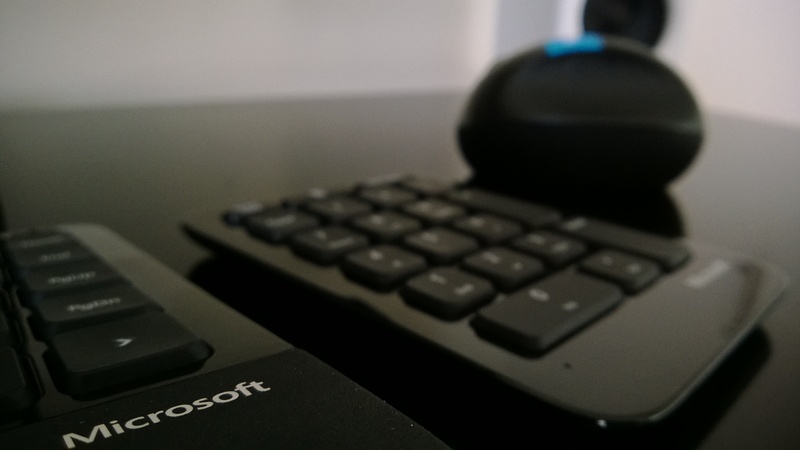 At first, I tried the Microsoft Sculpt Comfort Keyboard and Microsoft Sculpt Comfort Mouse. While they were OK, they weren’t very ergonomic at all. Typing and using a mouse a lot, my wrists feel fatigued after very long sessions. The keyboard keys didn’t feel as good as the K750 either, and the separate mouse didn’t come with a transmitter. Using the ICIDU USB Mini Adapter, which is Bluetooth 2.1 and USB 1.1, Windows 8 couldn’t find the mouse. With the Trust Bluetooth 4.0 USB adapter, the mouse was found, but frequently lost the connection for some reason. I also recently used a new Logitech B110 mouse while waiting for something interesting to be released. It stopped working after just a few months. I guess you get what you pay for. 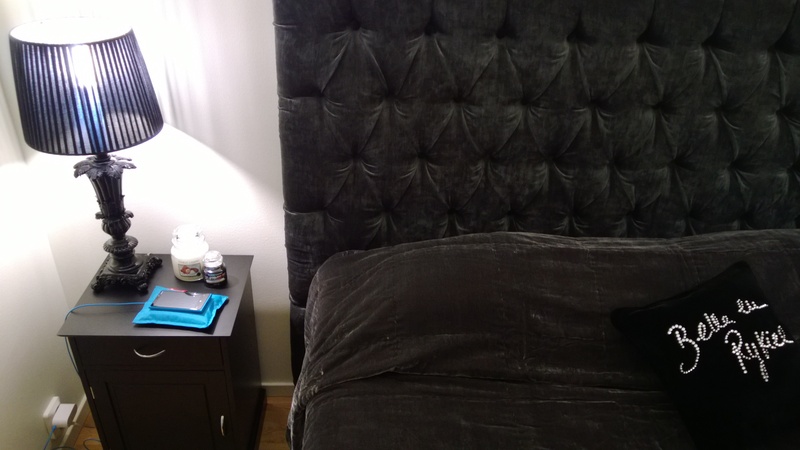 This is where the Microsoft Sculpt Ergonomic Desktop comes in. 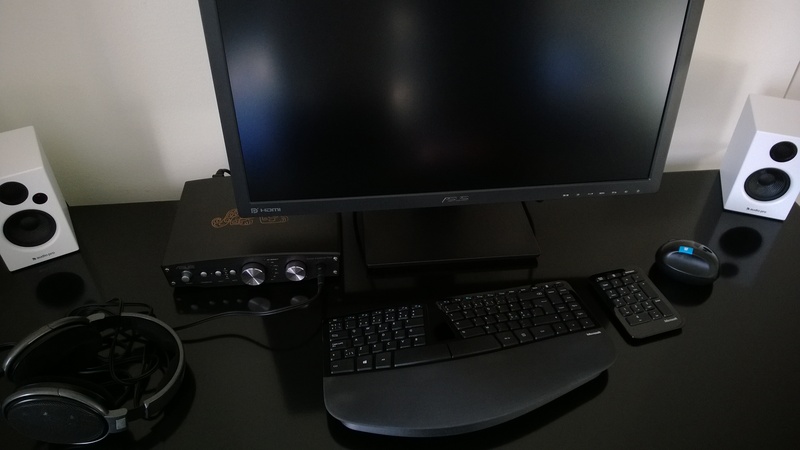 ASUS PB278Q, Asus Xonar Essence One and Audio Pro Addon T8 as a reference. Micro (Macro) soft and Bokeh courtesy of the Nokia Lumia 920. A closer look at the keyboard character layout. Windows and back button on the mouse. View from the side with the Sennheiser HD650 far off. 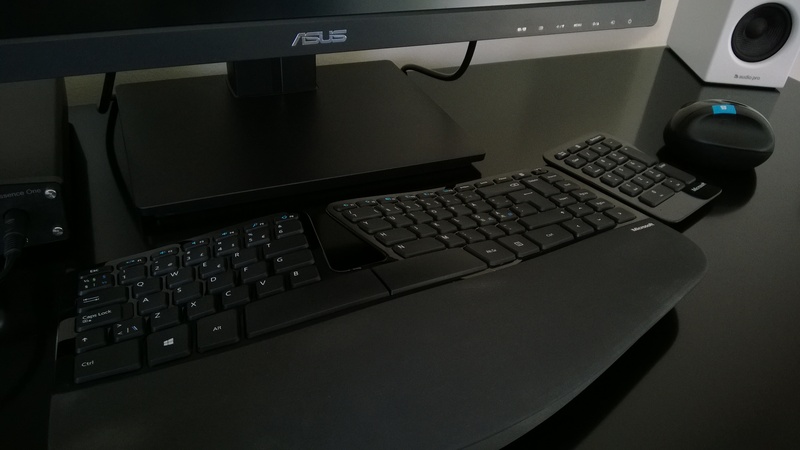 The Microsoft Sculpt Ergonomic Desktop keyboard is unconventional looking to say the least. 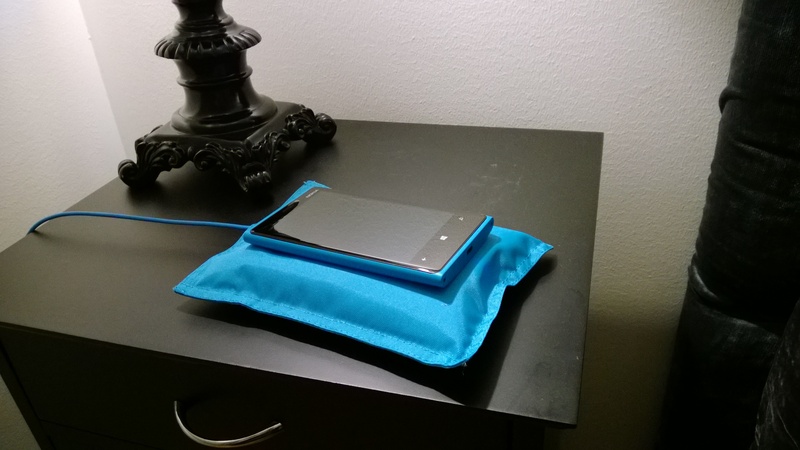 It has a separate part to optionally place the keyboard onto, to get an elevation to the wrist pad if you prefer. A fantastic little detail is that it snaps into place with magnets. When I placed my hands as they should, the wrists relaxed to the point that I just sat there like that for a while. It was that comfortable and natural. At first, the typing speed and spelling accuracy fell far below acceptable, but once I got used to it, it was lovely. The curvature and tilt together with the feel of the wrist pad is wonderful. It also has that premium feel to the keys like the K750 which the Sculpt Comfort Keyboard lacks. I do miss the battery free ease of the K750 but the mechanical switch of the Windows 8 function keys make up for it. As I mostly use the custom function keys I can leave the switch there and flip it whenever I need the traditional function keys instead of holding a function key depressed back and forth. A pet peeve with the keyboard is the upper most row of keys. They are both smaller and don’t have the same premium feel to them. I often miss the escape key because of this. Somehow, I occasionally hit the Insert key instead of the Enter key and additionally miss the arrow keys. The Enter key and arrow keys are a bit small, but its probably because of the confined key spacing akin to a laptop keyboard. Microsoft Sculpt Ergonomic Desktop mouse is very comfortable although I was skeptical at first. 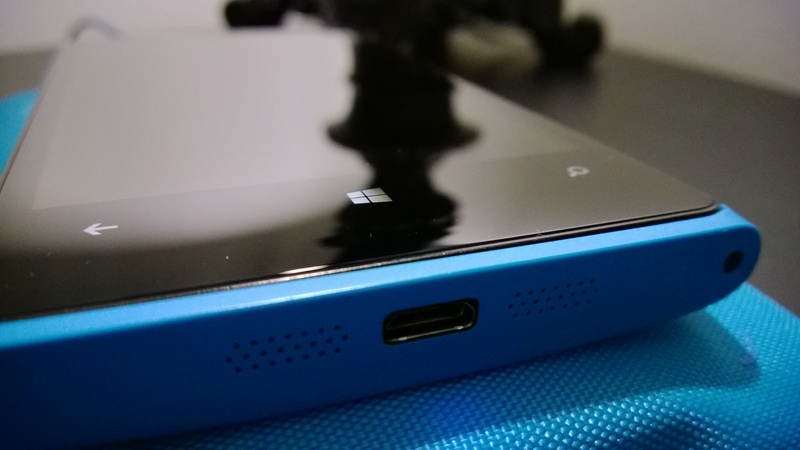 The thumb rests comfortably in the indentation, where you also have the Windows button to go to the start screen on top, and on the side you have a back button, barely visible. The battery compartment underneath is easily opened as the lid is held by magnets, but still firm, and it’s the same on the keyboard as well. On the mouse, there is a power switch underneath. On most surfaces the mouse has a nice glide to it. 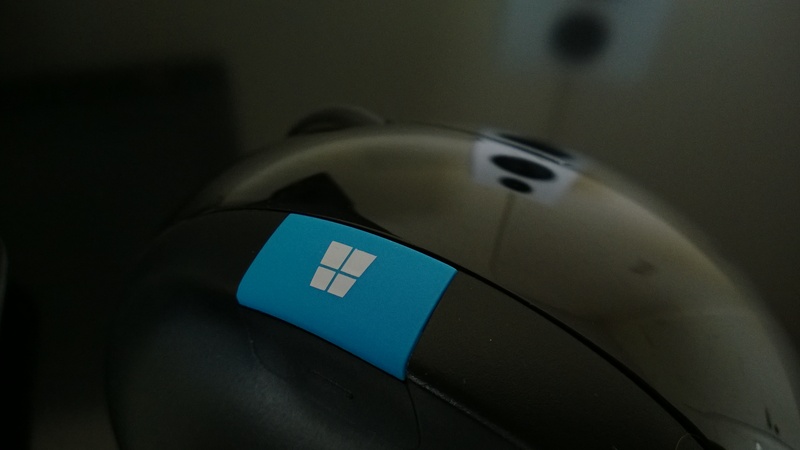 The scroll wheel is fairly standard, but good, and is also a middle mouse button. The right and left mouse buttons are also fairly standard, but nice. The separate numeric keypad is great, and leaves all that extra space on the desk. If and when I need it, I just reach for the drawer and get it out. What I also like is that all three, the keyboard, mouse and numeric keypad, use the same included transmitter. Quick and easy connection with no lag. The mouse is instantly active when switching the mouse on after being turned off. I couldn’t recommend the Microsoft Sculpt Ergonomic Desktop more whole heartedly. Love it. 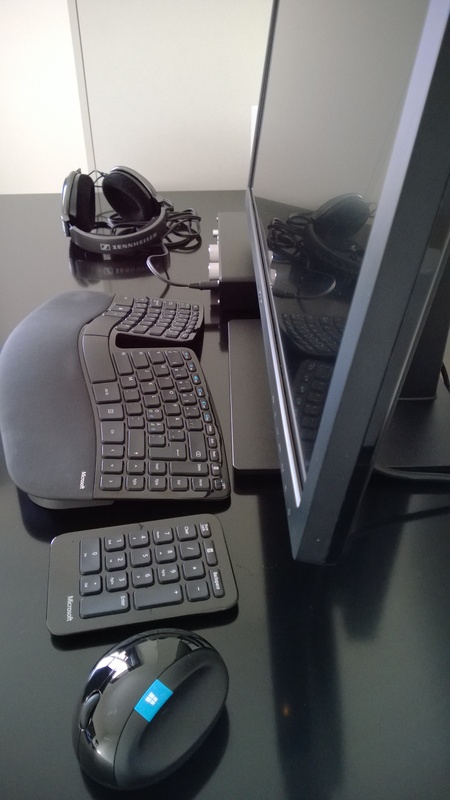 This entry was posted in Reviews and tagged Adapter, Arc, B110, Bluetooth, Comfort, Desktop, Ergonomic, ICIDU, K750, Keyboard, Keypad, Logitech, Microsoft, Mouse, Numeric, Sculpt, Solar, Touch, USB, Wireless on 20 October, 2013 by Spiritus et Technologiae.